Eastern junior Michael Letson runs the third leg of the 4x200m relay at the River Valley Open on April 2 in Bidwell, Ohio. 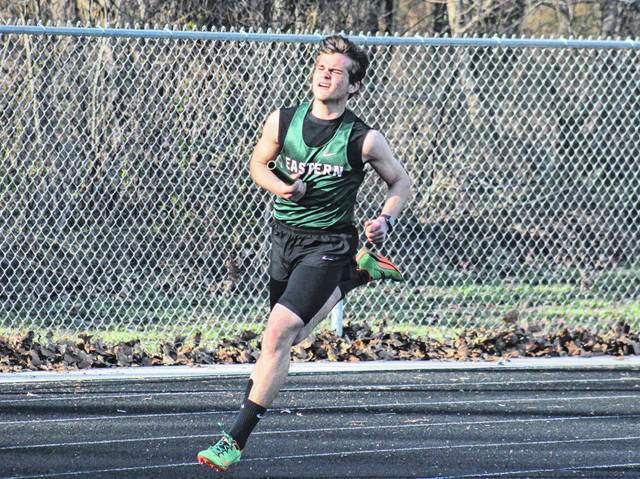 PARKERSBURG, W.Va. — The Eastern track and field team competed in the Russ Parsons Invitational on Saturday in Wood County, with the Lady Eagles placing fifth, and the EHS boys coming in eighth. Buchtel won the girls team title with a score of 136, 28 ahead of runner-up Martinsburg. University was third at 92, followed by host Parkersburg at 80. The Lady Eagles’ fifth place total of 67 was 36 ahead of Caldwell and Athens in a tie for sixth. The Lady Eagles’ lone championship came from Layna Catlett, who had a winning distance of 107-9 in the discus throw. Catlett also came up with a fourth place mark in the shot put at 31-5, while Caterina Miecchi was second in both the the discus and shot put with respective distances of 104-4 and 32-2. The EHS girls had a pair of third place finishes in individual events, with Rhiannon Morris running the 3200m in 12:44.15, and Katlin Fick clearing 7-00 in the pole vault. Whitney Durst earned fourth in the 3200m run at 13:55.11 for the Lady Eagles, with Alisa Ord took sixth in the 100m hurdles at 18.00, and sixth in the long jump with a leap of 13-7. EHS had two girls relay teams take third, with the squad of Morris, Ally Durst, Ashton Guthrie and Whitney Durst running the 4x800m in 11:15.24, and the quartet of Ord, Miecchi, Jaymie Basham and Sydney Sanders running the 4x100m in 55.94. The team of Ord, Basham, Guthrie and Brielle Newland claimed fourth in the 4x400m with a time of 4:47.24, while the team of Basham, Newland, Sanders and Guthrie was fifth in the 4x200m at 2:02.75. Parkersburg was boys’ champion with a score of 139, 16 ahead of Martinsburg in second. Buchtel was third with a 94, followed by University at 52, Athens at 50, Ravenswood at 47 and Caldwell at 20. The Eagles’ total of 17 was 11 ahead of Parkersburg Catholic in ninth. The Eagles’ lone champion was Noah Browning, who set a pace of 51.03 in the 400m dash. The EHS boys’ only other individual placer was Mason Dishong, who was sixth in the discus throw at 125-00. Eastern’s relay team of Nick Browning, Noah Browning, Michael Letson and Jayden Evans was fourth in the 4x400m at 3:48.07, while the team of Letson, Evans, Noah Browning and Colton Combs was fifth in the 4x100m with a time of 48.29. Visit www.runwv.com for complete results of the 2019 Russ Parsons Invitational.